The climate scientist depicted in the strip bears a striking resemblance to Mann, who developed the disputed “hockey stick” graph, which he claims proves global warming is imminently upon us. After the strip was published, Mann threw a fit on Twitter. In the days following the strip’s publication, Mann has retweeted many tweets expressing critical sentiments towards Dilbert and its creator Scott Adams. 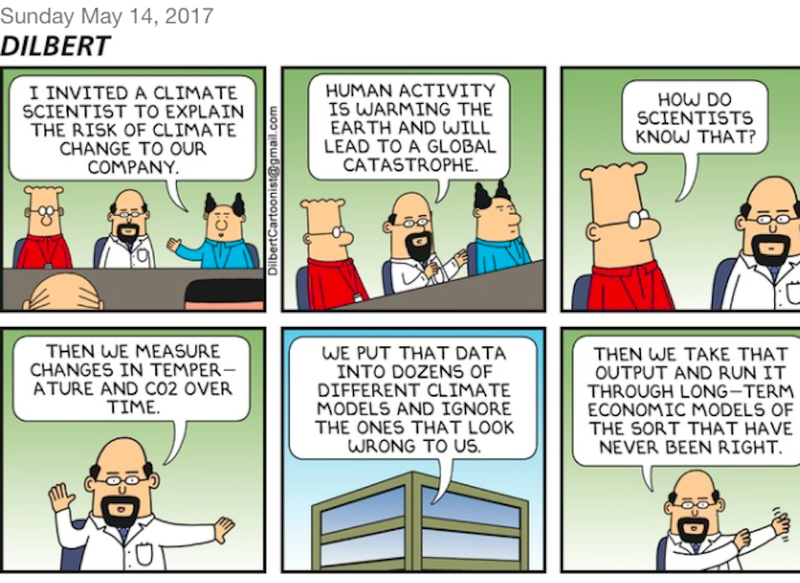 @Dilbert_ING @MichaelEMann Same. I liked Dilbert last time I saw one, which was maybe 15 years ago. Now that I know he's a climate denier, I'll "read" it even less. There are too many similar tweets to include in this post, but scrolling through Mann’s timeline, I would estimate there are about 50 other tweets similar to the ones above that he has retweeted over the course of several days. Mann is currently embroiled in a defamation lawsuit against the Competitive Enterprise Institute and National Review for publishing blog posts that were critical of Mann’s hockey stick graph.